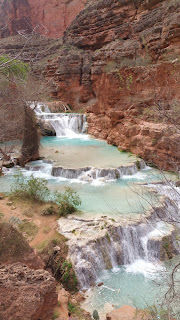 Last year I took my first trip to Havasupai Falls in northern Arizona. 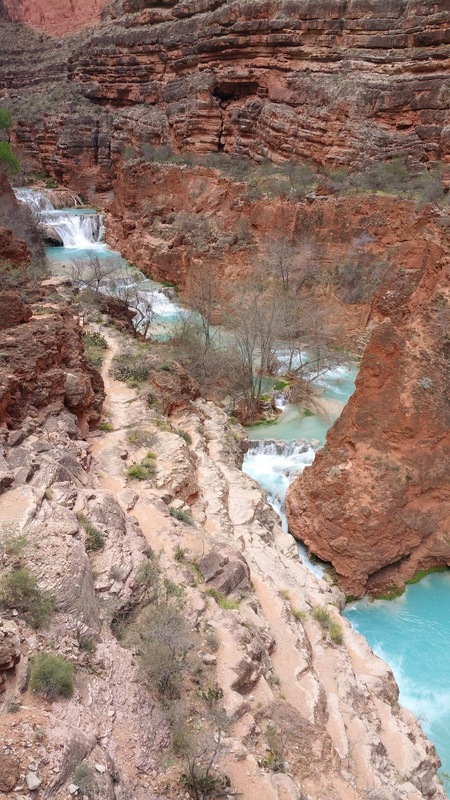 It was a whirlwind 2-day, 1-night trip that included just enough time to see Supai and Mooney Falls, relax in the water, and hike out. 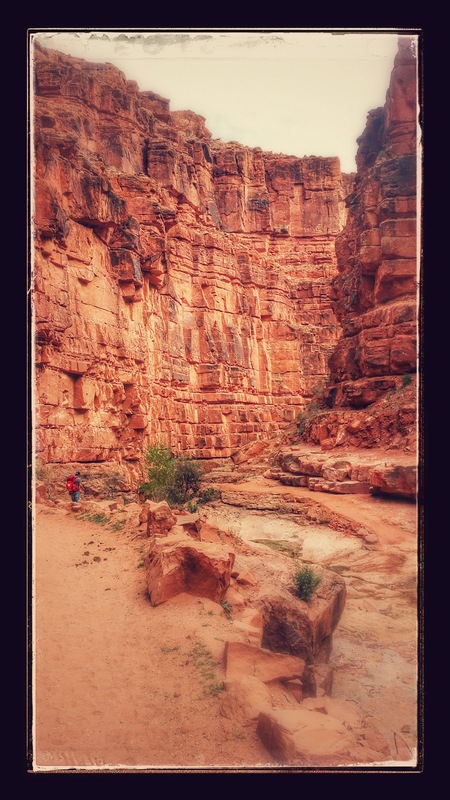 This year I revisited Havasupai, but extended the trip to 4-days, 3-nights, which gave plenty of time to explore further down the canyon to Beaver Falls and almost to the Colorado River. Read all about it! This year the tribe has changed their logistics. No longer can you show up and pay double to camp without reservations. Instead, you must reserve in advance. Make sure you receive a confirmation number and bring that with you. 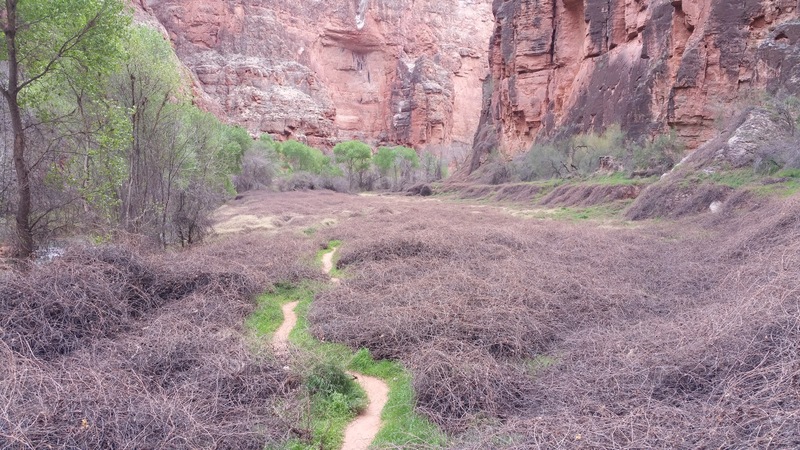 You do not want to hike 8-miles and learn that there is no record of your reservation. 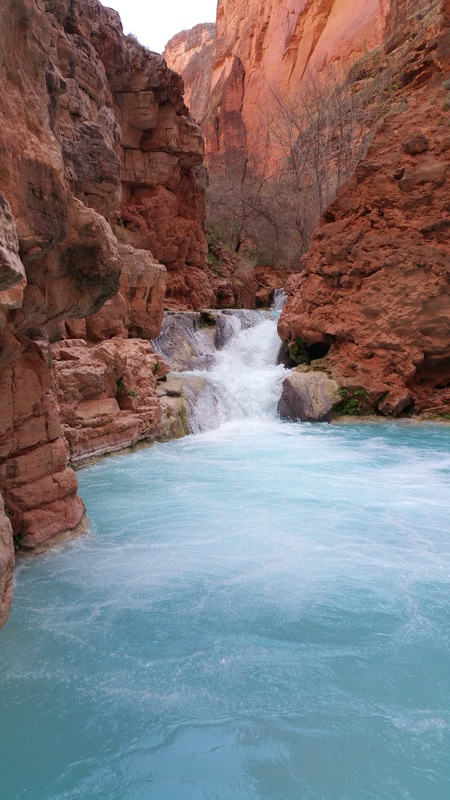 Here is the National Park Service page about Havasupai. Not the best view. Lots of dust. We got in to camp around 2:00 and were surprised to see an abundance of open sites--an advantage to hiking in for the first weekend of March (and opening day for the campsite fry bread vendor). We decided to shoot the moon and see if the site on top of Mooney Falls was open. Not only was it open, but it was spacious enough to accommodate all 12 in our group! 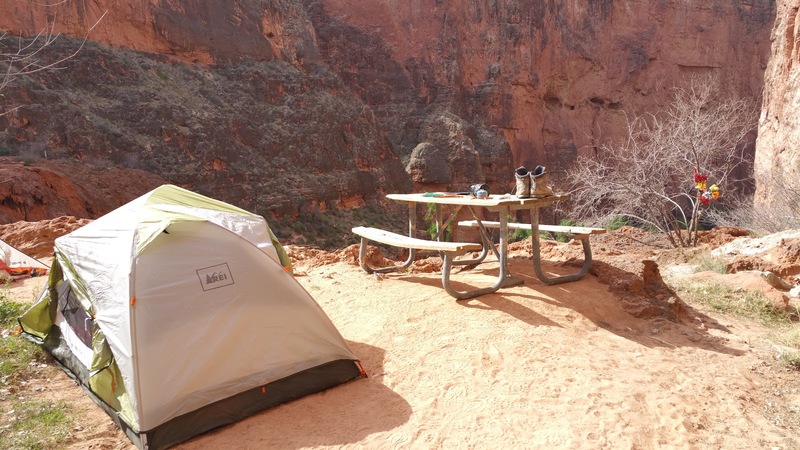 I pitched my tent on the very edge of the falls, but moved after the first night because the dust stuffed me up the entire next day. Also, surprisingly, the view of the canyon was better once you move away from the falls a bit. 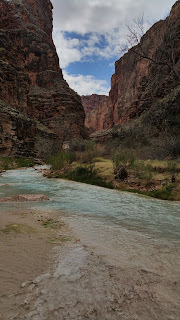 On Sunday we encountered some disconcerting weather, being in a canyon and all. It was threatening rain all day and around 3:00 PM a few raindrops began to fall and the wind started up. Moments later a 40-50 MPH gust blew down the canyon, knocking over a tree near the fry bread hut and tearing our campsite to shreds. Well, just the unlucky folks who left their gear outside and unsecured, or didn't stake their tents. Thankfully that was the only gust we dealt with and after a frantic few moments managed to secure everything in camp. But it was a good reminder of the weather's power and the need the need to be prepared for wind, rain, flooding, etc. Now what you came here for--the falls. Beaver Falls is about two miles downstream of Mooney Falls, an hour-ish hike with several creek crossings. 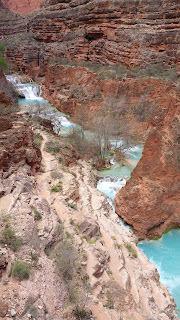 It's easy to see Supai, Mooney, Navajo and think there's no point in going further out of your way to see one more set of falls. Wrong. It's the most beautiful hike in the canyon and one of the most relaxing areas of water you can find. 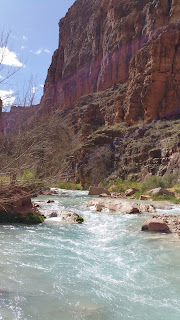 After scrambling down Mooney Falls the trail winds down Supai Canyon along the river. After the first two creek crossings it reemerges in an open field of grape vines that extends for maybe a half-mile. The unique vegetation combined with the open canyon give you yet another other-worldly feeling in an already alien environment. After the field there are several climbs up ladders and cliff cut-outs. They are not as technical as the scramble down Mooney, but they do make the hike more technical than other hikes in the canyon. Everyone in our group--even the less-experienced hikers--was able to make the trek to Beaver Falls. We spent about an hour climbing the different steps of the falls and enjoying the refreshingly chilly water. Beaver Falls proved to be the best part of Havasupai Falls on this trip. Next we tried to hike down to the Colorado River, without success. We started too late in the day, didn't have entirely enough food and water, and didn't have a great idea of how long of a hike to expect--frankly, a perfect combination for things to go poorly. What we did do, however, was pick a time to turn around regardless of our progress to the Colorado and that kept us out of trouble. Following through with a plan like can be difficult for a group of motivated hikers who are certain payoff is right around the next bend. Ultimately, we were a mile away from the Colorado when we turned around. It was frustrating, but responsible. Regardless of reaching the river it was a nice day hike with some more beautiful views. This hike is best left to fit and/or experienced hikers who can do the 16-mile round trip into a remote area of the Grand Canyon National Park. We have another reason to return.